My husband was considering a pastorate of a country church. The couple with whom we were staying overnight took us to see the parsonage. We couldn’t believe our eyes. It was an old, partly whitewashed, pieced together shack with a tin roof—the most disreputable-looking place we had ever seen. “And it does have hot and cold running water and an indoor bathroom,” added her husband. At the time we didn’t know that that was more than some parishioners had. We looked out from that high ridge upon miles and miles of fields, trees, and valleys. “You can even see the next state from here,” she declared. “And look this other way.” We did as she suggested, and the view was so majestic it almost took our breath away. My surroundings were not always so nice, but oh, the far view! How it thrilled and rested my soul to look out at it any and all seasons. During the winter, the dark outline of trees stood out starkly from the sparkling white snow beneath an intensely blue sky. In spring one could see the pink and white blossoms of apple and cherry trees, the lime-green of freshly-budded foliage, and the deeper green of corn shoots coming up in the fields. In the summer the corn grew tall, the blackberries and gooseberries in the valley ripened, and cows grazed contentedly. In the fall, the maples were a riot of color, as were the sunsets. Yes, the far view was beautiful! For the person who lives for Jesus Christ, so also is the far view beautiful. “For our light and momentary troubles are achieving for us an eternal glory that far outweighs them all. So we fix our eyes not on what is seen, but on what is unseen. For what is seen is temporary, but what is unseen is eternal” (2 Corinthians 4:17-18 NIV). If we live for this life only, we may enjoy temporal conveniences and pleasures, but our perception of distressing circumstances will be distorted. Through reading God’s Word we get a glimpse of the glory awaiting those who live for the Lord. As we keep our eyes on the goal that He has set for us, the beautiful far view will bring things into proper perspective and fill our lives with peace and joy. Dr. Muriel Larson was a prolific writer whose book Joy Every Morning went into 31 printings. You can read more of her writing here: http://advicedrmuriel.blogspot.com and http://powertochange.com/blogposts/author/mlarson/page/2/. As I settled into my seat at the Norfolk, Virginia airport, a sense of expectancy convinced me that I would meet someone special on the flight home. At the last moment, a flight attendant escorted a blonde boy down the aisle and settled him into the seat beside me. Is this the one I’m expecting? Just a boy? I thought. He shot an unfriendly glance at me. I sat back with a book as the flight attendant showed him how to fasten his seat belt. Lord, I prayed, this boy looks cold and mean. Talk to him, He seemed to say. Ask him his name. I turned to the boy and greeted him. “What’s your name?” I asked, certain he resented my interest. This time his expression seemed to question my sanity. That ended that. I tried to read my book, but couldn’t concentrate. The pilot announced, “Departure will be delayed for 15 minutes due to a storm front over Chicago.” Bad news, I thought. They’d only delay for a severe storm. As we waited, I became more convinced to talk to David, but now he flipped through the airline magazine. When the plane finally taxied toward the runway, he looked terrified. “Is this your first plane trip?” I asked. He nodded, clutching the arm rests. As we took off, I tried to lessen David’s fear by explaining what was happening. Finally his muscles eased, and he watched the scenery out the window. Little by little, he told me his story. He was being sent from his father and stepmother’s home to live with his mother in Seattle. He hadn’t seen his mother since birth—twelve years before. He’d be living permanently with her and her new family. He was to meet a new stepfather and a new step-brother and step-sister. And I’d thought he was merely afraid of flying! “I want to show you something,” he said shyly, tugging his nylon carry-on bag from under the seat. He pulled out a Bible and a book of children’s Bible stories. We discussed the pictures and the stories, delighting in each other’s company. His uncle, a pastor, had given him the books. His parents, he said, did not want to hear about God. Soon David had shared all of his belongings with me: shells, a fossil, a medal he’d won. Everything he owned was in that nylon bag. He had no suitcase on the plane. I fought tears, knowing that he and I would part in Chicago, where another flight attendant would lead him to another plane. Please, Lord, I prayed, what can I say to make this terrible transition easier for David? Soon an answer came. Nearing Chicago, we descended into thick black storm clouds. Streaks of lightning zigzagged through the dark sky. Lightning flashed wildly, illuminating our plane, flickering away, and then bursting into eerie incandescence. We flew into the storm’s fury, bucking like a bronco riding the black clouds. Behind us, a man wretched violently. Across the aisle, a business man folded his hands in prayer. What could I tell David when even adults’ nerves failed? I thought of his days ahead, when he would face an unknown mother and family, a strange neighborhood, and a new school. Tears welled in my eyes and, ashamed, I recalled my first thought: Just a boy? Smiling back at David, I was keenly aware that I’d met someone, who like all of us, is deeply loved by God. Elaine Schulte is the author of 36 novels and hundreds of articles and short stories. She and her husband now live in Tucson, AZ. My two-year-old, Sarah, happily skipped beside me on our walk around our apartment complex, each of us savoring the warm sunny spring afternoon. Silently, I prayed, Thank you Lord for the blessing of being a stay-at-home mom. School must be out, I thought, noticing a little girl carrying schoolbooks walking toward us. She looked so little, so alone. I couldn’t imagine letting my little girl walk home alone from school, or even the short distance from the bus stop to our apartment. The little girl was crying like her heart would break. I quickly scooped Sarah into my arms and hurried toward the child. Huge, dark fear-filled eyes looked up at me. “I lost my key. I won’t be able to get in my apartment,” she replied, her lip quivering. My heart ached, not so much about the lost key, but the empty home she faced every day as a latchkey child. I hugged Sarah just a little bit tighter. “Do you know where you might have lost your key?” I asked, hoping for some clue. She shook her head, tears streaming down her pitiful little face. Lord, she couldn’t be any older than eight-years-old. What am I going to do? I knew the verse. Jeremiah 33:3 was one of my favorites and one of the first scriptures I memorized as a new Christian nearly three years earlier. Lord, You know exactly where that key is. Please help me find it. “Okay, she said,” a slight smile forming on her sad face. I put Sarah down and we followed the little girl, the three of us continually scanning every inch of the sidewalk. I had about decided it was a hopeless situation. She could have lost her key at school or on the bus. Sorry Lord, I apologized. I did pray, didn’t I? Suddenly, my eyes diverted to a brilliant glistening in the parking lot, as though God highlighted something with the radiant Texas sun. “Stay here girls,” I instructed them and walked toward the shiny object in the street. Could it be possible? I wondered and bent down to pick up the object. I could hardly believe my eyes. It was a key! I ran toward the hopeful child. “Is this your key?” I asked. Her face lighted up like the sun. “Yes, that’s it,” she beamed. “Before you go home, I want to tell you how I found your key,” I said. She looked up at me with wide-eyed child-like wonder, not quite sure what to think about what had happened, or what she thought of me. I bragged on my Father, the keeper of the keys—the keys to all of life’s problems no matter how big or how small. “Thanks,” she said, flashing me a sweet smile before happily skipping home, tightly grasping her newly found key. Or should I say two newly found keys? Keep her safe dear Lord, I prayed. Susan J. Decuir lives in Carrollton, Texas with her husband, Ron. She loves to read, write, exercise at the senior center, minister by giving out gospel tracts, and play with her precious grandchildren, Evan and Emma. In this issue we are exploring eternal vision. Yet for so many people in nursing homes, the future seems bleak. Visit a local nursing home, and as you talk and listen to each resident, ask the Lord to help you see that person through His eyes. Remember that inside each wrinkled or weakened frame lies an eternal soul, an individual for whom God sent His Son to die. Help them to see that they still have value and purpose, even if it is only as an inspiration to you. If some residents do not know Jesus as Lord and Savior, introduce them to the One who loves them so much that He paid the price for their sins, the One who rose from the dead and waits eagerly to welcome them into heaven. For those who are believers, rejoice with them about the wonderful future that awaits them. Today in the midst of the hustle and bustle of the early morning rush hour, I saw God. As cars filled with determined, tired, and stressed people rushed past my apartment balcony, I looked up and saw the gentleness of clouds moving across the sky. The colors amazed me. Part of the sky was pale gray and below it, bright blue. In areas throughout the blue section, shining golden rays outlined white clouds. It seemed as if part of God’s radiance and glory highlighted and poured from the clouds. Through the sound of a blaring siren, I heard the joyful chirps and lilts of birds. They sang their varied pitches and melodies as if they were alone in the morning rush. I closed my eyes and felt the quiet breeze cooling my face. The scent of clean, fresh air that only comes after rain, danced on the breeze. The beauty God created surrounded me and filled me with His peace. So often, the demands of our daily lives keep us from seeing the beauty that God has placed in His creation—the very evidence that according to scripture He has given of His nature and person. It takes effort and a different focus to see the soft clouds, hear the joyful songs of birds, and feel and smell the quiet, cool breeze. We often need a new perspective, a new way of seeing to witness the testimony of God’s greatness in His works. Take a moment today to enjoy the Creator and His creation. Stand in awe as He gives you new eyes to see and fills you with His peace. The writing of Christine St. Jacques has appeared in Brio, Breakaway, Church Libraries, and Shining Star. She also has edited over 100 books. Fill the air with their fragrance in front lawn and lane. When bitter cold wintertime gives up its hold. With the title of “springtime,” new life after death. Marcia Krugh Leaser is a freelance poet from Gouldsboro, Maine. Is it silk, and ribbons, and lace? Is a woman fashioned by grace. Whose inward beauty shines through. And other fruits of the Spirit, too. For God to make her strong. And all of sin’s disgrace. And fashion a woman of grace. Kathy Hobaugh is a freelance poet from Broomfield, Colorado. A young woman who was a recovering alcoholic began attending our church. She brought her little son with her. The child also attended recovery meetings with her. The meetings always ended with The Lord’s Prayer and a recovery slogan. Maybe he had something there? Rebecca Barlow Jordan invites readers to deeper intimacy with God through enjoying both His presence and His blessings in two inspiring forty-day journeys. Her books 40 Days in God’s Presence and 40 Days in God’s Blessing feature fresh insights, poignant examples from life, memorable quotes, and through-provoking questions to ponder as you go through each day. Our delightful cover photo was taken by Amy Sullivan. 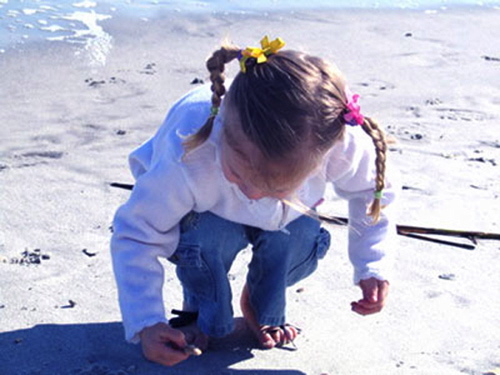 As the child on the beach examines a simple seashell, she demonstrates the childlike attention to detail that we all need to exercise in order to gain an eternal perspective. Amy L. Sullivan is freelance writer and the author of When More is Not Enough. Her website and blog can be found at http://amylsullivan.com.